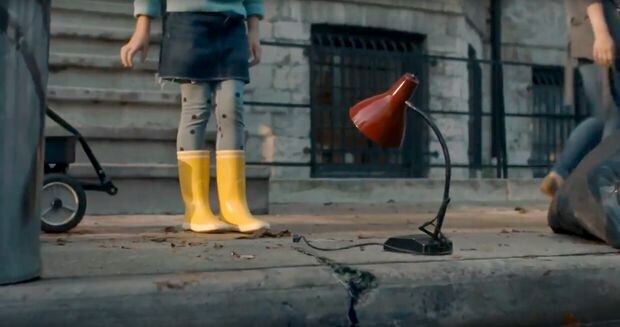 A still from IKEA's latest red lamp commercial. The last time we saw IKEA’s red lamp, it was sitting on a curb in the rain, its articulated plastic neck bent in anthropomorphic dejection. The ad became a classic in the marketing industry. Sixteen years later, IKEA Canada is releasing a sequel to that paean to consumerism − and changing up the message. While the U.S. commercial urged people to toss out old hand-me-down items whose value was nostalgic, rather than aesthetic, part two suggests that the new one is not necessarily better. It’s all part of IKEA’s strategy shift. The retailer now sees an untapped opportunity in consumers' growing willingness to reuse products: people are more inclined to visit product-swap groups on social media, or buy-and-sell websites such as Craigslist and Kijiji, to get rid of unneeded items without contributing to the landfill. The secondhand market in Canada was worth $28.5-billion last year, according an annual research paper released by Kijiji, and furniture is the fourth most popular product category. IKEA’s Canadian team regularly runs searches on secondhand sites to see how much of that furniture is theirs; on a recent morning there were 50,020 pieces of furniture for sale on Kijiji in Toronto alone, 5,980 of them IKEA items, or almost 12 per cent. A couple of weeks before that, the same search showed it was 14 per cent. “That is a higher market share than we have in our own market category. And we’re not participating in it," said IKEA Canada’s head of marketing, Lauren MacDonald. (IKEA has a roughly 10-per-cent share of the furniture market in Canada.) So the company is currently piloting a partnership with Kijiji to promote products for sale in the “As is" section − display models and returned or damaged items that are usually marked down in price in stores. It is also exploring a buy-back program that has been implemented in 14 other countries, allowing people to exchange lightly used items for IKEA gift cards; the company will either recycle many of the item’s materials or sell it to someone else. Ms. MacDonald believes these offerings could appeal not just to existing secondhand buyers and sellers, but also to people who may be reticent to meet up with a stranger to exchange products. “It’s an opportunity to come to IKEA as a safe place to trade – and you might need other things,” Ms. MacDonald said, such as a new slip cover for that used couch, or perhaps an energy-efficient light bulb for a neglected lamp. “Reusing things is much better,” he says. The actor, Jonas Fornander, is so recognizable that IKEA Canada has used his voice in radio ads for more than a decade. He is dressed in the exact same jacket as the first ad, his hair falling at the same angle in wisps across his forehead. Because it was not raining in the second scene, the team was concerned the jacket would appear too light in colour, so they dampened it slightly for a closer match. Aaron Starkman, partner and creative director at Rethink, acknowledged that it was daunting to attempt a sequel to an ad that won the grand prix in the film category at the Cannes advertising festival in 2003, and that was created by a famous director.